Making a dehydration drink is easy, and all you need is a glass of water and some O.R.S Hydration Tablets. The best dehydration drinks aim at not only fuelling your body with water, but by providing your body with the correct minerals and electrolytes that are lost through sweat. 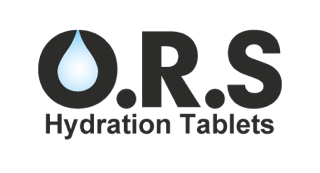 O.R.S hydration tablets contain glucose, sodium chloride and electrolytes, which are needed in order to efficiently hydrate. Minerals like these are needed in order to regulate fluid levels throughout the body. O.R.S Hydration Tablets are designed to be easy to consume; they combat the problem of swallowing pills, by easily dissolving in water on their own. Stirring or shaking is only needed if absolutely necessary, but the solution will make itself, provided you give it some water. An O.R.S hydration drink can be stored up to 8 hours outside of a refrigerator, and 24 hours in a refrigerator, meaning they can be made in advance for easy consumption later on. 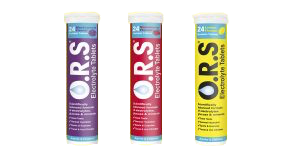 To make it even easier (or harder), O.R.S Hydration Tablets are sold in three delicious flavours; lemon, blackcurrant and strawberry. For general hydration, place 1 tablet in a glass of water (any amount, although we recommend 250ml), and allow the hydration tablets to dissolve. For hydration in sport, place 2 tablets in 500ml of water, and allow the hydration tablets to dissolve. For children under 6 years old, place 1 tablet in a glass of water, and allow the hydration tablets to dissolve in the glass. Children should drink 10ml of an O.R.S hydration solution per kilogram of body weight. For people suffering from diarrhoea, and other dehydrating illnesses, place two tablets in 200ml of water, and allow the hydration tablets to dissolve. O.R.S Hydration Tablets are suitable for vegans and vegetarians, are free from artificial preservatives, and does not contain yeast, gluten or lactose. Consult your doctor or pharmacist before supplying to infants under 2 years of age, or if you are diabetic, or on a low salt or potassium diet. DO NOT USE if you have intestinal obstruction, or suffer from problems with your liver or kidney function. Click the photo below to venture to our shop!